Name: Zeno Acrylic Modern Freestanding Soaking Bathtub 68"
This Zeno acrylic modern bathtub comes complete with an over flow, pop-up and drain. 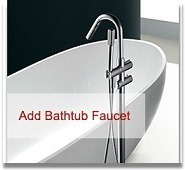 Zeno luxurious bathtub will instantly transform any bathroom into a spa like retreat. The unique silhouette features an ultra modern look that resembles waves crashing in around you. The Zeno soaking tub will make for a blissful bathing experience. With simple, but well though out orientation this elegant bathtub offers fun and trendy elements that are worthy of becoming your modern bathroom decor centerpiece. The Zeno freestanding bathtub will offer a high end luxury look without sacrificing functionality and charm.